This bottle is an example of the fine gilded and enamelled glass manufactured under the Mamluk dynasty, which ruled Egypt and Syria between 1250 and 1517. The design, dominated by a large-scale inscription in blue enamel, is typical of work produced around 1300 to 1350. The mouldings below the mouth of the bottle and around the top of the high foot indicate that the form of this vessel is based on a precious-metal prototype, for which the mouldings would have been structurally necessary. The decoration on the body is in two registers. The main feature of the upper register is three roundels containing a phoenix motif of Chinese origin, reserved in a blue ground. This bird, together with a Chinese-style dragon, had become a popular symbol of royal power among the Mamluks. Three roundels in the lower register contain an arabesque motif reserved in a red ground. These roundels divide the inscription into three parts. It reads, ‘Glory to our master the Sultan, the Wise, the Just King’. Texts such as this appear on many Mamluk objects and indicate that such items were originally made for use at court. The fashion for them probably spread to the richer members of Mamluk society outside the court and they were also exported to Europe. The flattened underside of the bottle and the high foot were left plain, since they could not be seen by those using the bottle, who would have sat on the ground in the Arab manner, looking down on the bottle. Large bottle of gilded and enamelled glass with flared foot and neck ring. The decoration consists of phoenixes in heraldic pose around the neck and floriated designs in red, green and yellow enamel. The inscription consists of a dedication to an unnamed Sultan. Secular pieces of enamelled glass rarely survive in good condition. This piece was probably used at court for serving drink. The shape of this bottle can be traced to the Ayyubid period with an almost identical layout employed on an example made for Salah al-Din Yusuf (1237-59), the last Ayyubid ruler of Syria. 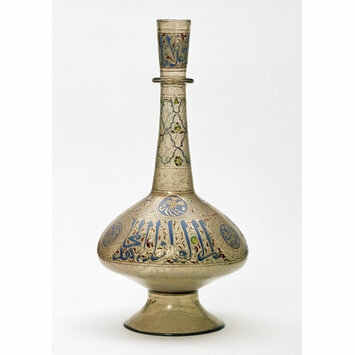 The second half of the 14th century was the most brilliant period of gilded and enamelled Mamluk glass. Objects made for secular use, such as large bottles, basins, perfume flasks and beakers, generally contain benedictory inscriptions wishing good health on their owner. This reveals the glass industry was one of mass-production for a wealthy elite who could afford the expensive materials. Gilded and enamelled glass is generally thought to have been produced in Syria and in Egypt during the Ayyubid and Mamluk periods. Though no chronology has yet been established, inscriptions dedicated to specific sultans on mosque lamps have helped to establish the development of decoration on this type of object. Syria is generally credited with the production of most secular enamelled glass, though finds from Fustat, Egypt, have yielded sherds of with a surprising variety of enamel decoration. This bottle appears to fit in with the middle to later style of enamelled glass decoration, with an elaborate and extensive design programme which covers the entire bottle. Figural decoration which is typical of the early Mamluk period, between 1250 and 1300, has been reduced here to a series of phoenixes in heraldic poses and the inscription to an unamed sultan has taken over as the primary form of decoration. Long-necked glass bottle with gilded and enamelled decoration, Egypt or Syria, 1300-1400. Watson, O. "Glass from the Islamic World," in Glass (ed. R. Liefkes), London, 1997, 30-31. 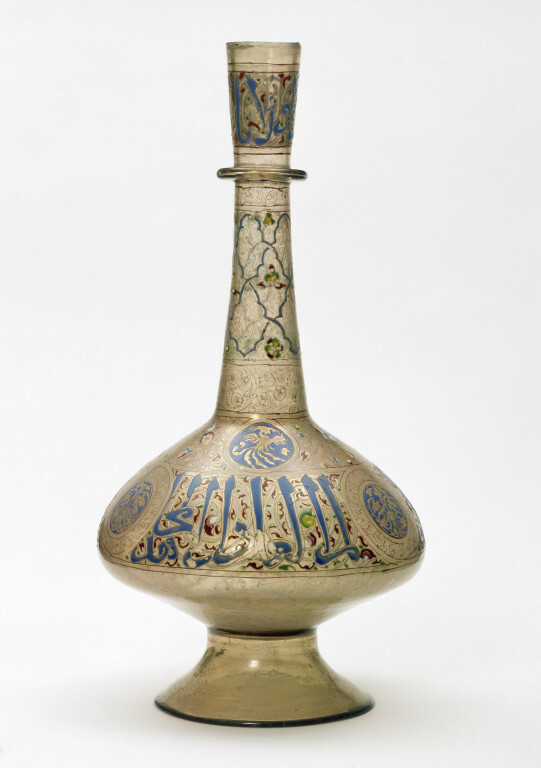 This bottle was probably used for serving wine and other drinks in a Mamluk palace. A connection with the court is suggested by the main inscription which reads, 'Glory to our lord the Sultan, the wise, just and zealous king'. The smaller decorative motifs include blue roundels containing a phoenix motif derived from Chinese art.